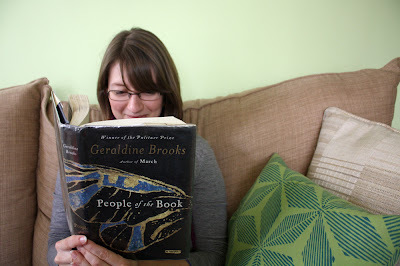 Bookbinding Etsy Street Team: BOOKS ABOUT BOOKS: A review of "People of the Book"
BOOKS ABOUT BOOKS: A review of "People of the Book"
For my "books about books" post, I wanted to take a brief break from bookbinding instructional books and instead write a review about a novel: People of the Book by Pulitzer Prize-winning author Geraldine Brooks. The novel was recommended to me by a shopper at an art show this past fall as we chatted about bookbinding, and I bet you would enjoy it as much as I did. The novel centers around the journeys of an actual book, the Sarajevo Haggadah, a rare Hebrew illuminated manuscript. The book begins from the perspective of an Australian book conservationist who is hired to work on the book. As she carefully examines the pages and binding of this rare codex, she finds clues — such as wine stains, salt crystals, a piece of a rare butterfly wing, and a white hair — that provide insight into where the book may have traveled and how it was created. Each chapter of the novel goes into detail about a particular clue, filling in the details of how the insect wing happened to be hidden in the haggadah's binding, or how Kosher wine was spilled on its pages. And while all of these details unfold, the reader also learns of the book's journey, from its creation in Spain, to the story of how it survived the Spanish Inquisition, the rash of books burned by the Nazis, and the bombings in Bosnia. And while People of the Book is a work of fiction with imaginary characters, many of these stories are actually based on the haggadah's remarkable history. And as a bookbinder, it was also a treat to read a novel that included mentions of linen thread, wheat paste, gold leaf, vellum, and other familiar materials. Yes, this is a little bit nerdy, and perhaps the typical reader wouldn't get quite as much of a kick out of this as I did. But regardless of the fact that the topic was of particular interest to me, this novel was one of the most engaging and enthralling books I've read in several years. It was easy to get caught up in the lives of the characters and their interactions with the haggadah, spanning from 1480 to the present time. The pieces of the story were woven together as carefully as one would create an exquisitely-made handbound book. I would highly recommend it to anyone looking for a good read. Have any of you read People of the Book? I would love to hear what you thought of it in the comments. I LOVED this book. I'm both anxious and reluctant to read her other books, for fear of disappointment. You've got me intrigued! I just checked it out from my local library, and it has me interested right from page 1. I simply loved this book! This is a fabulous book. The different histories woven so beautifully through the story and how they combine to give the Sarajevo Haggadah such a rich life is just magic. Another great bookbinder's read is Robert Hellenga's 'The Sixteen Pleasures' about a book restorer working in Florence after the flood of the Arno in 1966.